If nonsurgical treatments are not successful in easing problems of thumb arthritis, your doctor may recommend replacing the surfaces of the joint. Joint replacement surgery is called arthroplasty. Arthritic joint surfaces can be a source of stiffness, pain, and swelling. The artificial joint is used to replace the damaged joint surfaces so patients can do their activities with less pain. Unlike a fusion surgery that simply binds the joint together, arthroplasty can help take away pain while allowing the thumb joint to retain movement. A second purpose of the preoperative visit is to prepare you for your surgery. You'll begin learning some of the exercises you'll use during your recovery. And your therapist can help you anticipate any special needs or problems you might have at home, once you are released from the hospital. Before we describe the procedure, let's look first at the artificial thumb joint itself. Surgeons have several ways to replace the thumb joint surfaces. One way is to attach the ends of a prosthesis implant into the bones of the thumb joint. A newer method uses a small, marble-shaped implant to form the new joint surfaces. This spherical implant works like a ball bearing to give the joint a smooth arc of movement. The procedure to put in the prosthesis implant takes about two hours to complete. The newer method using the ball implant takes 30 to 60 minutes. Surgery may be done using a general anesthetic, which puts you completely to sleep, or a local anesthetic, which numbs only the hand. With a local anesthetic you may be awake during the surgery, but you won't be able to see the surgery. In this procedure, an incision is made across the base of the thumb. The soft tissues are spread apart with a retractor. Special care is taken not to damage the nearby nerves going to the thumb. The joint capsule is opened, exposing the CMC joint. 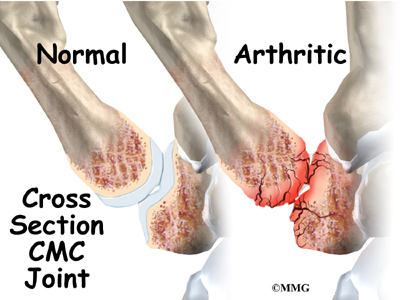 The ends of the bones that form the CMC joint surfaces are taken off, forming flat surfaces. A burr (a small cutting tool) is used to make a canal into the bones that form the thumb joint. The surgeon sizes the stem of the prosthesis to ensure a snug fit into the canal and inserts it. When the new joint is in place, the surgeon wraps the joint with a strip of nearby tendon. This gives the new implant some added protection and stability. The skin is stitched together and a splint applied. The newer method for replacing the thumb joint is to use a spherical implant that looks much like a marble. The surgeon makes a small, one-inch incision at the base of the thumb joint. 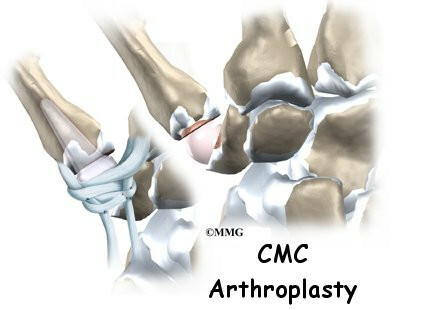 The ends of the bones that form the CMC joint surfaces are removed, forming flat surfaces. A burr is used to make a small notch, or canal, in the ends of the two bones. The surgeon shapes the notch so the ball-shaped implant will fit snugly in the joint. The implant is placed between the ends of the shaped bones. The soft tissues are sewn together, and the thumb is splinted and bandaged. Any operation carries a small risk of infection. Replacing the CMC joint with an artificial joint is no different. You will probably be given antibiotics before the operation to reduce the risk of infection. If an infection occurs you will most likely need antibiotics to cure it. You may need additional operations to drain the infection if it involves the area around either implant. In these cases, the artificial joint will need to be removed. A second operation will probably be necessary to fuse the thumb or to perform an arthroplasty that does not require an artificial prosthesis. All of the nerves and blood vessels that go to the thumb travel across, or near, the CMC joint. Since the operation is performed so close to these important structures, it is possible to injure either the nerves or the blood vessels during surgery. The result may be temporary if the nerves have been stretched by retractors holding them out of the way. It is uncommon to have permanent injury to either the nerves or the blood vessels, but it is possible. One problem that occurs with artificial replacements is that they can fail. The older silicon-type prosthesis has been shown to break apart and fragment. Most types of prostheses can displace, or move out of the correct position, causing problems. Most of these problems will require a second operation to remove the prosthesis and may need to be repaired with a procedure called an excision arthroplasty. After surgery, your thumb will be bandaged with a well-padded dressing and a splint for support. The splint will keep the thumb in a natural position during healing. Your surgeon will want to check your hand within five to seven days. Stitches will be removed after 10 to 14 days, though most of your stitches will be absorbed into your body. You may have some discomfort after surgery. You will be given pain medicine to control the discomfort. A physical or occupational therapist will direct your recovery program. The time it takes to rehabilitate depends on the type of procedure used. Recovery takes up to three months after replacement with a prosthesis implant. Patients wear an arm-length cast with the thumb pointing out for about three weeks after this type of joint replacement surgery. Patients are able to return to normal activity within three to five weeks after having spherical implant surgery. Recovery is faster because the procedure doesn't require the surgeon to disturb the tendons near the joint. Range-of-motion exercises can start within one week after surgery using the ceramic ball. The first few physical therapy treatments will focus on controlling the pain and swelling from surgery. Heat treatments may be used. Your therapist may also use gentle massage and other hands-on treatments to ease muscle spasm and pain. Your therapist's goal is to help you keep your pain under control, improve your strength and range of motion, and regain your fine motor abilities with your hand and thumb. When you are well under way, regular visits to your therapist's office will end. Your therapist will continue to be a resource, but you will be in charge of doing your exercises as part of an ongoing home program.